Roger Federer rolled back the years to come back from one set down and defeat Juan Martin Del Potro in his last Round Robin match to reach the semifinals of the 2013 ATP World Tour Finals. The 6-time champion at the event played catch-up for the most part of the match, conceding an early break in all three sets, but stepped up the gas to break back twice in the final set of the match and reach the semifinals at the year-end event for an amazing 11th time. This means that he has only failed to reach the semis once in his 12-year presence in the premier competition featuring the World’s Top 8 Tennis players. Losing serve in the first game of the match, Federer looked devoid of any answers to Del Potro’s brand of attacking tennis, as the Argentine broke the Swiss maestro’s serve for the second time in the set to extend his lead to 5-1. Federer however, showed his first signs of life in a 10-minute spell of breathtaking tennis, as he won three consecutive games (including one break) to cut back Del Potro’s lead to 5-4. The Argentine summoned his serve to stop Federer’s charge and held his serve to close out the first set with a 6-4 scoreline. The crowd, mostly donned in Red & White and urging the Swiss on, saw the first outburst of frustration from Federer, as he netted a backhand to gift Del Potro an early break in the second set. The Argentine raced into a 3-1 lead but Federer again rallied from behind, and this time, much more fruitfully. After breaking to get back on serve, Federer reached the tiebreak while playing his best attacking game, and it helped him take the tiebreak with considerable ease, with Del Potro only winning 2 of the 9 points played. 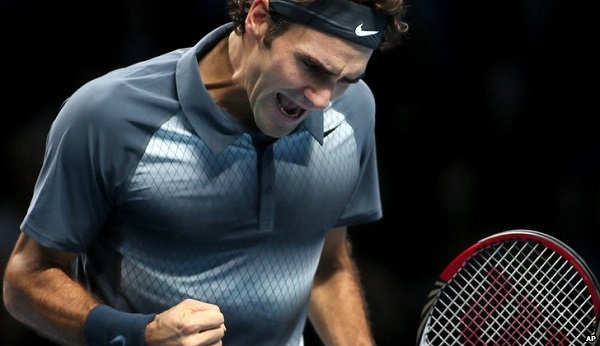 The crowd celebrated wildly, and so did Federer, showing how much the match meant to him. Come the third set, and it was Del Potro again, who started well, moving quickly ahead to 3-0. Yet again, Federer pegged the Argentine back, breaking and getting back on serve, and looking the sharpest he had done in the match. The fan-favorite at the O2 Arena turned it on for the ninth game of the decider, as he had Del Potro scampering around before sending him the wrong way for a break point. The Argentine sent a forehand long, and Federer was serving for the match. Del Potro managed to force a break-point, but it was always going to be Federer, who sent a booming ace down the middle, his 10th of the match to wrap up the quarterfinal. Federer will now face his nemesis and World No.1, Rafael Nadal in the semifinal, who has conquered almost everyone he has come against since returning from injury at the beginning of the year. However, considering that the Indoor Hard Court is Rafa’s weakest surface, and Federer’s record against Nadal on the surface is perfect (4-0), the aging Swiss will fancy his chances of reaching his 9th final at the tournament. Nadal is bidding to reach the final of the ATP World Tour Finals for the second time, as he looks to win the only crown that has evaded him in his illustrious career. All said and done, the Fedal is bound to serve up a cracking encounter, and there will be no Tennis fan around the world not glued to the television at 2 pm GMT today.